I know it’s hard; wishing loved ones who have passed away can be a part of your special day. But here are a few ideas that lets us honor their memories in some subtle and bold ways. Hopefully these ideas give you a little peace of mind. * Wear something – This is the most private way to honor a lost loved one and no one will even know. It keeps them close to your heart without drawing attention to their absence. * Tribute in your ceremony program – Its short, sweet and simple in an “Loving Memory” section. * A Toast – It’s a great way to bring the family and friends together for a special moment of reflection and memories. * Consider your favors – Did someone have cancer? A donation to the American Cancer Society makes a meaningful wedding favor and helps a great organization. * Save them a seat – A beautiful reminder of the loved one you’re missing; an empty seat in their name is a special way to recognize a passed loved one. 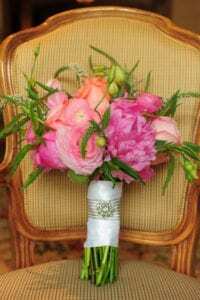 Place a bouquet on a chair during the reception or on a pew during the ceremony. Thankfully we didn’t have to incorporate memories of a lost loved one into our wedding. If you need to I am deeply sorry for your loss and know they are looking down on you and smiling knowing they are not forgotten.